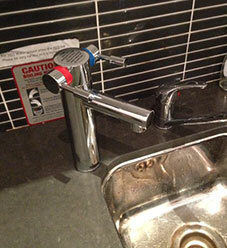 When space is limited, our under sink water systems are the answer. 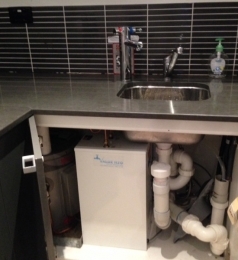 These ‘out of sight’ under sink water systems can be installed just about anywhere in commercial and industrial applications where filtered drinking water is required. Ideal for office kitchens, staff rooms or lunchrooms where space is limited, our under sink water systems utilise space under the sink inside kitchen cupboards. 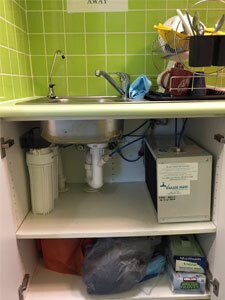 Under sink water units are plumbed in by our experienced water cooler service technicians to connect directly to your main water supply. Filters included in the under sink system ensure the continuous delivery of fresh, clean, filtered water direct from your mains pressure outlet, without chemicals, odour and organic impurities. Our combined boiled and chilled under sink water system provides unsurpassed quality in the delivery of both boiling hot and refreshingly chilled filtered water seamlessly at the touch of a button. The stylish multifunctional chrome tap on the combined hot and cold under sink water system – complete with a childproof feature – allows a steady flow of both boiling hot and cold water. This under sink water system delivers 110 x 160ml cups per hour of boiling water and 80 x 160ml cups per hour of chilled. The hot tank of the under sink water system is made from hard, durable copper; easy to remove for servicing when required and has a capacity of 3.6 litres. A cold water only under sink water system is also available. Need cups for your water cooler?